From History of Vernon County, Missouri. 1887, p. 797. (Farmer and Stock-feeder, Section 8, Post-alice, Bronaugh). The largest stock-feeder and one of the most successful farmers of Moundville township, as well as among its most publicspirited citizens, is Albert Duncan, who was born in August, 1844, in the Old Dominion, and a son of William Duncan, also of Virginia nativity. While still an infant he was deprived of the parental watch, care and guidance of both father and mother by death, after which he was taken to Lafayette county, Mo., where he was reared to the life of a farmer and stock-raisera calling for which he hasa natural adaptation. In his efforts is this direction he has been unusually successful, and this has resulted from industry and economy, largely coupled with sound judgment, and that rare but invaluable quality, practical common sense, which has been acquired by close observation and years of experience. After attaining his majority Mr. Duncan continued his residence in Lafayette county and there made Herculean efforts to obtain a start in life. Iii 1872 he married Miss Mattie Zenbucyer, a native of Maryland, and some four years after, or in 1876, he came to this portion of the State. Since then Vernon County has had no more worthy citizen then he. He owns 320 acres of choice land in a high state of cultivation and at the present time is feeding 262 head cattle and 400 head of hogs; and not a little credit is due him for the interest he has taken in the development and promotion of this industry throughout this community. Mr. and Mrs. Duncan have a family of four children, Gertie, Adger, Gaylord and Ollie. They are members of M. E. Church. All that Mr. D. now owns he has made himself coupled with the assistance of his worthy wife, who is a most estimable lady. This is one of the representative families of the township, each member of whom is held in sincere esteem. Roberta Swindell descends from Albert and Mattie Duncan. She says that the maiden name of Martha Duncan was mis-spelled in the 1887 County History. She confirms that Albert's wife was Mattie Zentmeyer not Zenbucyer. Roberta also notes that two more children were born after the above - they were Barker and Robert. 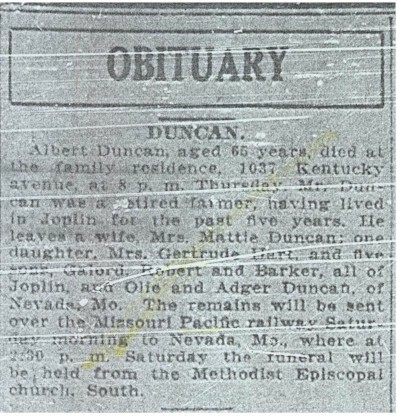 Left: Albert Duncan's obituary appeared in the October 14, 1910 issue of the Joplin Globe. Notice that Albert died in Joplin but his funeral and burial were in Nevada. He is buried in Deepwood Cemetery. Right: Roberta says that the photo to the right says "Mr. Duncan" on the back. 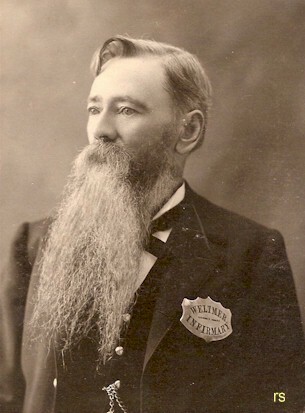 The badge that the man is wearing says Weltmer Infirmary. It looks like some kind of official badge. Note - there is no positive proof that this is Albert Duncan, so if you can confirm the identity one way or another, please let us know. At this point, Roberta is "pretty certain" that this is Albert Duncan. We don't know how Albert Duncan was affiliated with the Weltmer Institute but it was an important Nevada business. Roberta shared this photo of the children of Albert and Mattie Duncan. The photo includes Gertie, Adger, Gaylord, Ollie, Barker and Robert. The obituary above tells that in 1910, three sons lived in Joplin - Gaylord, Robert and Barker, and two sons lived in Nevada - Ollie and Adger.